One of a Kind, Professionally Decorated Log Home at the Top of the Mountain. Truly a Piece of history...Our amazing home was hand-crafted from 2 log cabins built in the 1860's, and originally located in the Tennessee Mountains. The cabins were carefully dismantled, transported and reassembled in their current location in the early 1980's. When we arrived on the exceptionally beautiful mountain top and saw the antique square cut logs, beautiful stone foundation and fireplaces we fell in love with this home even before seeing the interior! The area has the feel of a bygone era where time moved more slowly and we felt like we had come home. Our beautiful mountain home was completely remodeled in 2012-2013. The house has 4 bedrooms and 3 full baths, 2 wood burning fireplaces and a wood stove. It is professionally furnished and decorated and strikes the perfect balance of old fashioned mountain styles with all the comforts and amenities of modern living. All of the heart pine used in the floors, walls, and beams was salvaged from a cotton mill in South Carolina and the chestnut and oak was reclaimed from several barns north of Weaverville. Respecting the historic value of the house we carefully restored the bathrooms and created a state of the art kitchen with an Italian gas/electric range and island that the whole family can enjoy. The porch is the best ‘room’ in the house. With its fresh mountain air, breathtaking sunset views, rockers and a swinging bed, it’s great for relaxing with a book or taking an afternoon nap. The furnishings in the house are a combination of pieces from Ralph Lauren and other designers as well as antique pieces thoughtfully and lovingly collected throughout the South. We have had a wonderful time decorating our home! In addition to the beauty of the home itself, we also have breathtaking views of Big Bald Mountain and the 3rd hole on the Wolf Laurel Golf Course. Our full Country and Village Club memberships allow you to dine in the clubhouse and use the pool, playground area, exercise facilities, pavilion, trout ponds (yes we have rods! ), hiking trails and shelter/cookout area close to The Bald Mountain. Golf is available for a fee and whether you golf or not this course is a must see. It is located on the highest elevation of any golf course in the South East and is both incredibly beautiful and incredibly challenging. Since we have owned this home it has become a passion for us. We have fallen in love with the area and the people here. Great care has been taken to create a unique and comfortable living space. We are only able to use the home during the winter season, and we hope very much that you can enjoy it during its prime season. We live in Canada where we own property in Lake of the Woods Ontario. We love the outdoors and it shows in our choice of surroundings both inside and out. Our family has been in the furniture business for many years, which has brought us to the Asheville area numerous times for the High Point Market. During these stays we have explored the area extensively and fell in love with the mountain styles, and the breathtaking nature. When we found Wolf Laurel we were hooked and we began searching for a vacation home in the area for our family to have a mountain getaway. We were captivated by this historic antique log house, which we have now converted to our home away from home. When we stay here, it feels like taking a trip back to a simpler time. The stress is gone. There is plenty to do in the area, but some of the best times are just laying around the house - a book by the fireplace, a glass of wine on the porch, unwinding in the claw foot tub or the steam shower, just slowing down and relaxing. It is not hard to do when surrounded by the incredible natural beauty and the fresh mountain air. We have a perfect view of the 3rd hole on the world class Wolf Laurel Golf Course. Views of Big Bald Mountain from our lovely porch! The house is at 4,800 ft elevation. Spices and condiments. Please let us know if you are looking for anything specific as we have more than we can list here. Our kitchen was renovated in 2013 and is fully equipped with all appliances required for modern living. We also have basic condiments in the pantry, salt, sugar, oil, vinegar & spices. Our beautiful adjoining dining room seats 8-10 people. In addition to the selection of books at the house, there is a small library at the Village Club. Golf is available at an additional fee through the beautiful Wolf Laurel Country Club which is a 5 minute drive form the house. Full Golf Membership at the Wolf Laurel Country Club provides golf access for a per game fee in addition to access to the dining room and brand new fitness center (opening May 2016!) Full Membership at the Wolf Laurel Village Club allows access to the pool, tennis courts, basketball courts, trout pond and picnic pavilions. 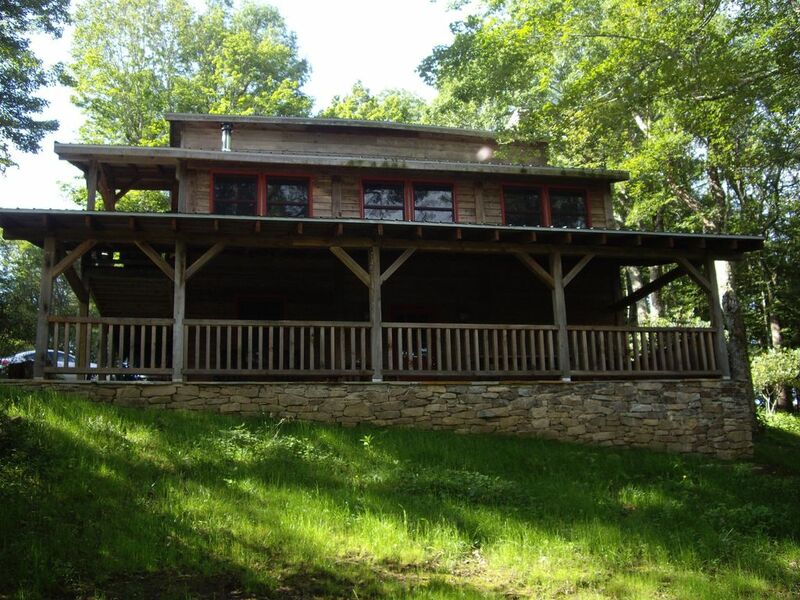 The house has a direct view of Big Bald Mountain, overlooks the 3rd hole of the Wolf Laurel Golf Course and the hiking trails connect to the Appalachian trail system. The house was professionally decorated in 2012-2103 and amenities include a steam shower, clawfoot tub and all new furniture and appliances. There are also two open wood burning fire places, 1 wood stove AND we are continually updating. The Most Beautiful Mountain Property! We had the most wonderful time at this mountain top retreat. The home décor is outstanding! This place is pure magic! The only problem is leaving it. Care has been given to every detail and the result is an elegant comfort rarely found. The pictures are wonderful but the reality is even better. If you can bear to leave the fabulous porches you'll find access for hiking the AT with mile high views. Golfing, horseback riding, fishing and more allow something for everybody. We can't recommend it highly enough. Thank you Lindsey for sharing the experience of your amazing home! The location of the cabin is ideal, on top of a mountain with amazing views at every angle. Lindsey has done an amazing job decorating the rustic, but updated cabin. Every detail has been thought out. Top of the line kitchen appliances to modern bathrooms, but everything else is rustic and cozy giving you that comfortable cabin feel. There were so many nooks to go read a book, the hard part was deciding which one. The fireplace was perfect as we had some unexpected snow which only enhanced our experience. The setting was very peaceful and we saw plenty of deer, turkey, and red-tailed hawks. My boys really enjoyed the stocked trout pond and caught their first rainbow which was a beauty. Lindsey recommended a simple, easy hike which led to 360 views of the Smokies and the Blue Ridge Mtns which connects to the Appalachian trail and met some hikers. A great door for a picnic. The sunsets and sunrises were magnificent. The beds were very comfortable and my family had a wonderful, relaxing time. Thank-you for sharing your home with us! Your home was fabulous and was everything as depicted in your photos. We loved the view and the amenities that we were able to partake. We had a wonderful time and enjoyed the beauty and comfort of your home. Thank you so very much in letting us experience your mountain treasure. We are looking forward to return next year. Our family can't say enough good things about this beautiful and well appointed log home. My wife, 16 month old son, dad, sister, nephew and I just spent the weekend here to attend a family wedding. We all left feeling that we wished we could have stayed a full week. This log home is very cozy and has an interior design that should be in magazines, while still having all the modern conveniences you need. We had terrible weather during our trip due to a hurricane off the NC/SC coast, but the warmth of this home (figuratively and literally) kept our spirits high and was wonderful space for our family to spend time together. We highly recommend! Scott and Christa, I thoroughly enjoyed my stay at your lovely home. Rustic, yet modern, in beautiful, peaceful surroundings. The sunsets were absolutely stunning! The house was clean and provided everything I needed. Excellent kitchen which was fully equipped. Even the one day with the water supply issue did not dampen my enjoyment. I also enjoyed the Nature Trail leading to the Appalachian Trail...saw a lot of deer! I hope to come back again. The perfect place to stay to get away from it all!! Ours is one of the few privately owned properties that have access to the Appalachian Trail - 2,200 miles from Maine to Georgia of the best trail in the USA. (Yes we have maps at the house!) The views from the house are breathtaking and the fresh mountain air is invigorating. The Wolf Laurel Stables are a 5 minute drive from the house and if you choose to go into town, Asheville is only 30 minutes from the mountaintop. It is a mecca of history, arts, restaurants, shops and filled with lots of fun. Asheville is home to the Biltmore Estate, constructed by the Vanderbilt family in the late 1800's and the largest privately owned home in the U.S.. (Check it out at: www.biltmore.com) There is also the Grove Park Inn (check out the porch rockers!) and Pack Square Park. Please contact us prior to booking online.